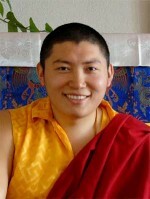 Born in 1981 as the son of Kyabje Tsikey Chokling Rinpoche and recognized at a young age and received an abundance of instructions from great masters, Phakchok Rinpoche is one of the throne-holders of the Riwoche Taklung Kagyu Lineage and a lineage holder of the Profound Treasures of Chokgyur Lingpa from the Nyingma School of Early Translations. Rinpoche also received his Khenpo title (similar to a PhD) after completing within seven years the traditional nine-year curriculum of Buddhist philosophy at Dzongsar Institute of Advanced Buddhist Studies, in Bir, India.Presently, Phakchok Rinpoche is abbot of several monasteries in Nepal, a Vajra Master at Na-Nying Shedrup Ling, assists monasteries and practice centres in Tibet, heads dharma centers, and teaches at various places around the world. He oversees a wide range of humanitarian projects in South Asia through organizations such as the Chokgyur Lingpa Foundation. Rinpoche’s teachings are direct, lively, and practical, with a strong emphasis on the view of the Great Perfection, the uncontrived non-conceptual meditation of Mahamudra, the tireless implementation of the Bodhisattva’s conduct, and the Mahayana’s teachings on wisdom and compassion. Riwoche – Phakchok Rinpoche’s Riwoche Tibetan Buddhist Temple is located in Toronto, Canada. A Dharma group of Phakchok Rinpoche students, with events and updates. Little Bang, Bangkok Meditation Guide is to serve as a compass for meditators in Bangkok – of which there are quite a few. Focuses on English Language Dharma events. Practice and study group based on the Tibetan Buddhist tradition of Shambhala, as taught by Chogyam Trungpa Rinpoche and Sakyong Mipham Rinpoche. The meditation technique that we practice and teach is shamatha-viphashana, mindfulness- awareness meditation. This technique originates directly from the Buddha Shakyamuni and has been passed from teacher to student for over 2500 years.